My recent adventure (as some of you know) began on Friday night, February 26, with an apparently simple case of minor stomach flu. Over the weekend, things got worse. By 7:30 on Monday evening (Feb. 29), Barbara and I made our second trip to the emergency room. This time, a small obstruction was found in my lower abdomen and I was admitted to hospital. Further tests on Tuesday pinpointed a tangle in my small intestine. When the one possible “non-invasive” technique changed nothing, I was rushed into surgery around 11:00 am on Wednesday morning, March 2. Warned of several dire possibilities, when I awoke in the recovery room at exactly 12 noon, I knew it had gone as well as it possibly could. Even so, there were eight more days in hospital before I finally arrived home yesterday (March 10) at noon. The usual causes for an abdominal obstruction are tumors, scars from prior surgery, or a lingering stomach injury. I have none of those. So, what happened is a mystery. But the take-away, for both Barbara and me, is that if something feels wrong, get it checked out! Untreated (and we were supposed to go away on a small vacation the day we went to the hospital instead), this could have killed me. I am tremendously grateful for the wonderful work of the doctors, nurses, and support staff of the hospital here in Owen Sound. Weak as a kitten, and very tired, I’ll mostly be taking it easy for the next little while. So stories might appear a little less frequently, or be a lot more “show” and a little less “tell” for a couple of weeks. 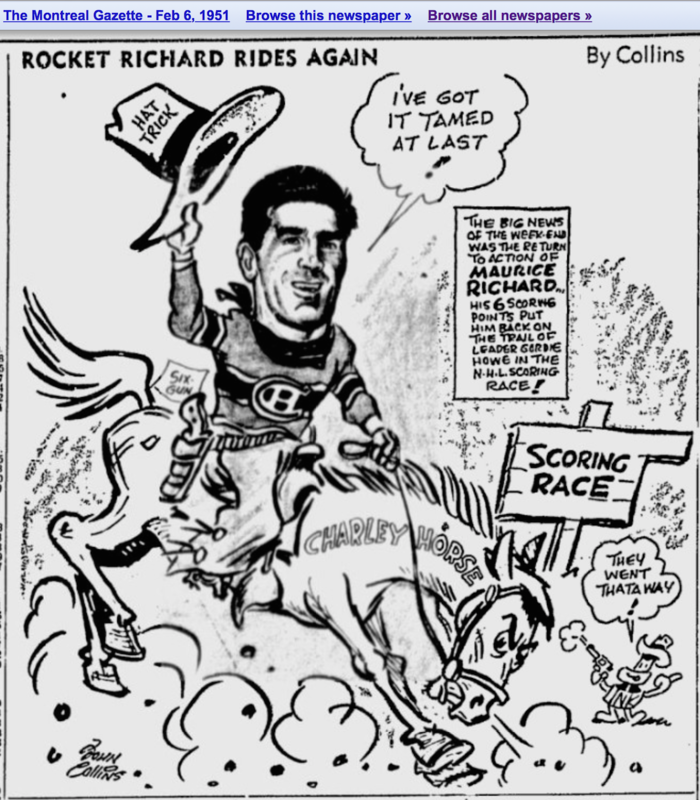 Still, like Maurice Richard recovered from his charley horse in 1951, I’m back in the saddle again! 110%, 200 feet of ice, Eric. Get well soon! So glad you didn’t start that vacation. That’s something the two of you can do when you recover…something to look forward to! Both of you–rest up!! Eric, it is so good to read your blog again. Glad you are home and recuperating. Your mom has been keeping me up to date. I hope you received my best wishes from her. Take care of yourself and take it easy. We had no idea! We are so sorry to hear about this. Please tell Barbara that we would be happy to help “the caregiver” and the Patient in any way we can – just call! Having spent five days in hospital in January after a heavy vertigo attack, I empathize with you. Prayers for your complete recovery are en route from West 109 St. in Manhattan. “Warned of several dire possibilities” —- wow. So glad you are feeling better and on your way back to full recovery — take it easy. Pretty much an easterner through and through … but my Dad loved Gene Autry best of all the “Singing Cowboys” of his movie-going youth! Eric, So glad you are on the road to recovery. Will be great to see you in May. All the best to you and Barbara. Dear Eric: I have been following your ‘adventure’ on FB since it started. These obstructions can come out of nowhere it seems. The fact that you had nothing else prior to this episode is truly a mystery! I am relieved you went to EMERG & that they took things seriously & got you into surgery! Please take ALL the time you need to recover fully. We will await your blog with patience…..
Oh & the title of your blog was so-o apropos!!!! So sad to hear about your recent problems. and Barbara. I’ll say a prayer for you. Later Gator. Best wishes for a speedy recovery, Eric. Your friendly neighbourhood bookstore is rooting for you! Best wishes Eric for a full and complete recovery. So glad things worked out for the best. Take care pal. Wow! Glad you’re OK. Speedy recovery, my friend. Well Brother, welcome back to your rightful place at the keyboard! My wisecracking instincts are urging me to grouse about being cheated of your company during that “brief vacation,” but it’s not the time for my stupid, insufferable jokes. Kathy and I are relieved and truly thrilled that you are back from the clutches of the medical profession, however skilled they may be, and Barbara, you may celebrate with back to back full nights sleep! God bless you both!